A creative giveaway item for attendees at the International Association of Museum Facility Administrators (IAMFA) 2013 Conference in Washington, D.C. has won multiple awards from the Society for Marketing Professional Services (SMPS). The brightly colored snack bag was given to participants who toured the National Zoological Park as part of the conference’s “Zoo Day” event. The bags were created and donated by IAMFA sponsors Mueller Associates and Quinn Evans Architects. 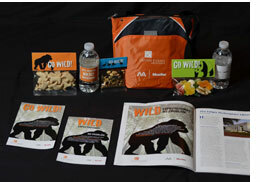 The giveaway included a bright orange cooler bag, custom-designed snack packages, a branded water bottle, and a promotional card with a “Wild Expectations/Go Wild” theme. The theme was developed by Mueller Associates and Quinn Evans Architects to underscore their experience with challenging design projects. In addition to numerous museum and library projects throughout the East Coast, the team has several projects underway at the zoo. At the SMPS National Conference in San Antonio in July, the project was awarded second place in the Tradeshow Marketing category. The snack bag was a winner among 210 entries submitted to the SMPS Marketing Communications Awards program nationwide. Regionally, the Washington, D.C. chapter of SMPS awarded the campaign its “People’s Choice” award along with an Honorable Mention in Tradeshow Marketing. The awards have been presented to Jessica Reid, director of business development for Mueller Associates, and Jeanine Quaglia, principal and director of marketing for Quinn Evans Architects. Both Reid and Quaglia are members of SMPS. Established in 1984, Quinn Evans Architects specializes in architecture, planning, urban revitalization, and historic preservation, including sustainable preservation and stewardship. The firm has more than 60 professionals in offices in Washington, D.C., and Ann Arbor, Michigan; and studios in Detroit, Michigan, and Madison, Wisconsin. For more information, visit www.quinnevans.com.